Southern California’s Mercury Marine Experts – Diagnosis, Service, Maintenance, Re-power & Restoration. PROBOATS is a Mercury Marine Premier Service Center for Outboard, Mercruiser, Diesel and Mercury Racing Products. We Specialize in providing Top Quality Services & Performance Improvements for Mercury Marine Products ONLY. Boaters from around Western United States, even Hawaii, come to PROBOATS for the Best in Service & Rigging. PROBOATS provides OEM Parts & Technical Assistance for all Ages of Mercury Marine products. We LAKE TEST all Boats after Annual Service or Engine and Drive Repairs. On the Water Testing is the Only way to check Boat & Engine for Acceleration & Handling, Correct Propeller Pitch & Application, Proper Engine Cooling, Steering, Hull Leaks, etc. All technicians are Certified Mercury Factory Trained and keep up to date with the Latest Training & Information. We are Verado, Optimax, 4-Stroke Outboard, Mercruiser, Racing, EFI, CARB Emissions (Catalyst) and Outdrives Certified. 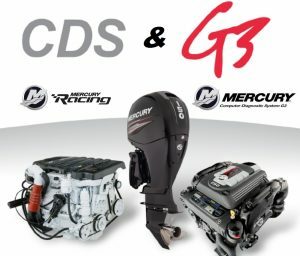 Only Genuine Mercury Marine OEM Parts are Installed for Engine & Sterndrive Service & Repairs. PROBOATS has a complete collection of Mercury Marine Specialty Tools and Equipment to Professionally Complete Services and Repairs on your Boat. We do Warranty Repairs on all Mercury Marine Power Systems including Diesel. Boats 27′ & under are stored inside PROBOATS service bays. Boats up to 40′ in length are stored outside in 24-hour Security Protected Storage. Click on Products & Services for a list of the many services we can provide. Mercury Outboards & Mercruisers should be Serviced Annually or every 100 Hours; (whichever comes first). Mercury Race Engine schedules & requirements vary depending on engine model. Please contact us for requirements of your engine. We ONLY use Mercury Marine maintenance items & lubricants. Mercruiser has a 3-Year Cycle for Annual Services. Year-3: Major Service; Basic service plus,water impeller, distributor cap, rotor & ignition wires, engine/sterndrive alignment, etc. Closed cooled engines are scheduled for anti-freeze change every five years. Most Mercury Outboards have a 3-Year Cycle for Annual Services. Email us, or call 909-599-0531 about a Service Program for Your Boat. NOTE: Annual Services are billed at Flat Rate for Labor; + Service Parts + Tax. Additional repairs completed which are not Annual Service Related are billed at Flat Rate, upon Client Approval.